Unlike the news from this week, losing our aunt was not unexpected or sudden, as she had been battling cancer for years. Long goodbyes bring a unique sort of grieving, and although the loss is just as painful, in some cases, there is the opportunity to use each of your remaining moments as a gift, and that is exactly what she did. The greatest of those gifts was a series of videos that one of her nephews made of her after the initial news of her cancer’s return. He flew across the country, camera and pages of interview questions in hand, and filmed hours and hours of a documentary-style video covering every imaginable angle of her life. We watched a few portions of the video at her memorial and it was so incredibly healing to be able to laugh and cry along with her stories and insights on life. This will be a gift that her daughter can treasure forever, and even potentially share with her own children someday, giving them a glimpse of the spectacular woman who raised their mother to be the strong and incredible young woman that she is today. Although our aunt had a medical diagnosis that drove the urgency to get her stories on tape sooner than later, the news I received this week was a reminder that for many people, the urgency is there and they just don’t know it. As this week’s ME-search, I encourage you to take a step toward sharing your story or asking someone you love about theirs. Yes, it will probably feel awkward and uncomfortable. I cannot even imagine the courage it took for the nephew to contact our aunt and basically skip asking permission and just tell her, “this is what we’re going to do,” before showing up on her doorstep with a camera and tripod. What two things do you want to make sure your kids know about YOU. Not just how much you love THEM, but something about YOU. Your favorite book when you were their age. What your first school dance was like. How you met their father. What you wanted to be when you grew up. What made you follow/not follow that path. What two things do you want to know about your childhood that only a parent, relative or childhood friend can answer for you? Ask now. What two things do you want to know about that parent, relative or childhood friend? You don’t need to do a full video documentary to make this a valuable exercise (although that was truly amazing.) Just a phone call, an email, or even a text. As I mentioned in last year’s post, life is unpredictable – live and learn to your fullest every day. 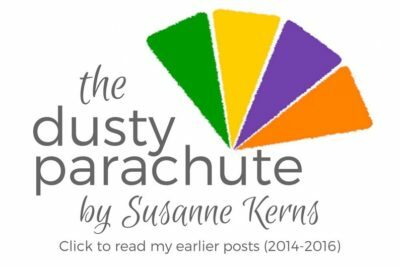 This post is from the Monday MEsearch series over at my Dusting Off My Parachute Facebook group. Join us there for more daily prompts for micro-goals and resolutions.